With the teams so evenly matched, who'll win the Super Bowl is too close too call, I think. But no worries -- there are loads of other Super Bowl bets you can place on the game at AllYouBet.ag. “Marshawn Lynch has carried his regular season form into the playoffs and he’s looking unstoppable at the minute,” said one AllYouBet.ag oddsmaker. 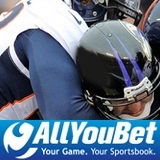 American-style online sportsbook AllYouBet.ag has a couple of generous Super Bowl bonus offers to get you in the mood for the biggest game on the sporting calendar: Deposit up to $100 using bonus code SBBONUS14 and get a 50% bonus absolutely free. Bet $1000 on the Super Bowl and get a $100 free bet.